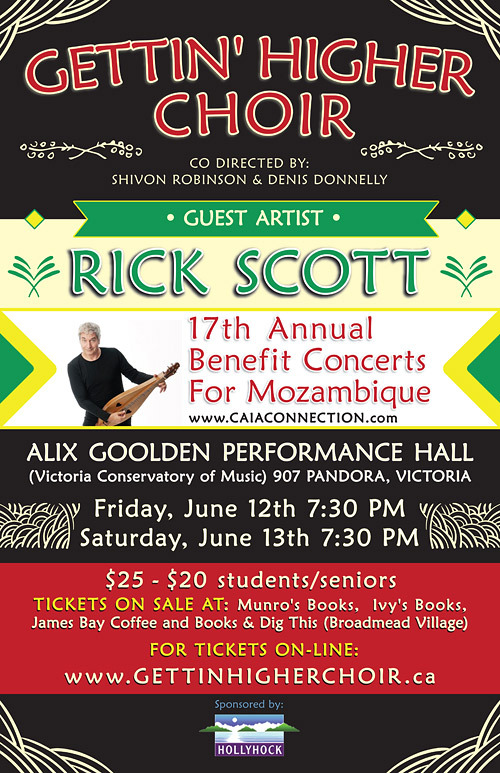 As always I am looking forward to our singing the great songs Denis and Shivon have lined up for us and this time I am particularly looking forward to having Rick Scott as our guest artist. He is a musical and performance phenomenon! He will lift everyone out of their seat without them even having to stand up! What a fabulous, uplifting, intimate evening!!! As a 10 year choir member I took this session off (big regret) but was looking forward to attending the concert. The music was fabulous and I loved that Rick started the show – clever change up. Rick’s enthusiasm and very personal stories (granddaughter & friends death) were so touching. Sheri U and Beth N.C were the only other 2 guest artists that I believe brought the audience into their life in such a personal yet gentle and humorous way. Also, Rick turning to the choir during one of your songs to engage/encourage them for more than a brief moment was lovely and encouraging to the choir. Thank you Rick. One of the best! Three times while singing Prayer of the Children I had to sing through tears. Denis’ arrangement of If I Had A Hammer was excellent and fun to sing (traditionally a sing-a-long song that the audience was advised not to try to sing along with ~ who would have expected that of the Gettin’ Higher Choir! Singing with Rick was was nothing short of Grrrrrrrreat! I was sooo sorry that I wasn’t in shape (as I’d hoped) to attend the concert but I gave my ticket to my eldest daughter who enjoyed it immensely. I look forward to singing with you all again in September. Until then, have a great, safe summer.